Lifting Saudi Arabia's ban on women drivers will cut the number of car crashes, Interior Minister Prince Abdulaziz bin Saud bin Nayef has said. He did not present any evidence to back up his claim, saying only that "women driving cars will transform traffic safety to educational practice". Saudi Arabia has one of the world's worst traffic death rates, with about 20 reported fatalities every day. The ban on women drivers is to end in June next year. The announcement was made by King Salman on 27 September. In a series of tweets (in Arabic) on Thursday, the interior minister said: "Women driving cars will transform traffic safety to educational practice which will reduce human and economic losses caused by accidents." He also said the country's security forces were "ready to apply" traffic laws to men and women. 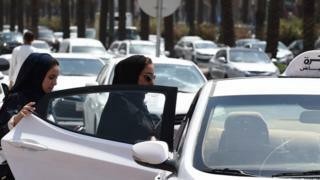 The minister did not elaborate how lifting the ban would reduce the number of car accidents in the Gulf kingdom. There are more than 10 million adult women in Saudi Arabia, including foreigners. Statistics show that an increase in car numbers on the roads inevitably leads to a rise in car accidents. In the US, for example, vehicle numbers increased by 3.6% between 2014 and 2016, but road fatalities went up by 13.6% at the same time. However, in Saudi Arabia the number of vehicles on the road could be somewhat mitigated because an estimated 800,000 or so foreign chauffeurs employed to drive Saudi women could potentially lose their jobs. The lifting of the ban has been welcomed by female activists and the international community. Campaigner Sahar Nassif called it "a great victory", while UN Secretary General Antonio Guterres said it was "an important step in the right direction". Interior Ministry spokesman Mansour al-Turki said women would be allowed to drive from the age of 18. However, details of a bill allowing women to drive are still being discussed and there have been concerns that women could face tighter controls than men. Following King Salman's announcement, some of the world's biggest car makers started advertising their vehicles directly to women in Saudi Arabia. Among the firms using Twitter for their adverts are VW, Ford and Nissan.